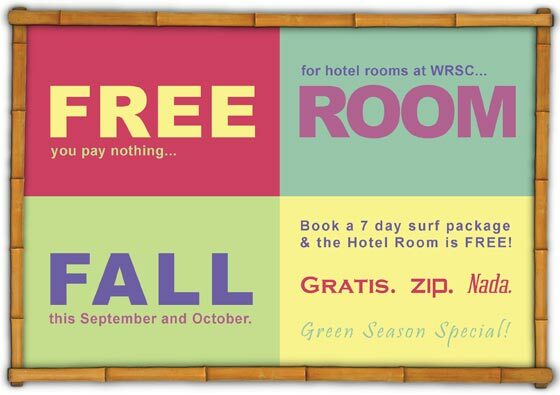 At Witch’s Rock Surf Camp, we go Loco for Green Season! September and October are the only really slow months of the year, so we decided to offer the best surf deal on the planet: If you book our standard surf package (lessons or tours) for at least seven days we’ll give you the hotel room for FREE! 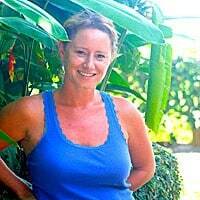 Green Season in Tamarindo is one of our favorite times. Yes, it will rain, sometimes a thunderstorm every day. But it’s unpredictable. Some years, it’s really wet. It’s a crapshoot every year. Here’s what we do know: the south swell waves will be uncrowded, all the flowers and plants will be in full glorious bloom, the temperature will still be tropical, the town will be mellow, the staff will be even more tranquilo than usual, airline rates will be at their lowest, and you can have a surf vacation in Costa Rica for chump change. You can spend a full week at Witch’s Rock Surf Camp; including airport pickup and drop-off from Liberia Airport, Lessons or Tours program with all instruction and transportation, Board Rental, and yummy Daily Breakfast…and a FREE ROOM. Pura Vida from your friends at Witch’s Rock Surf Camp!